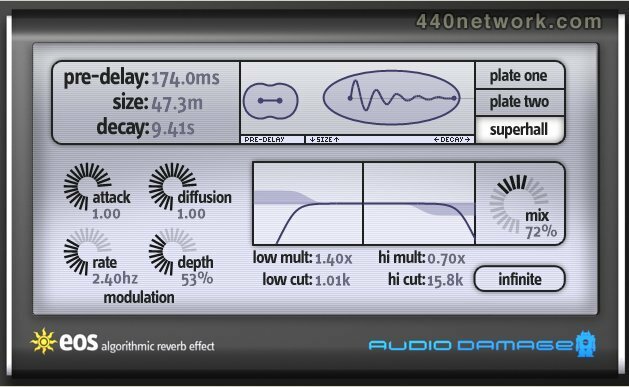 Eos consists of three high-quality custom-designed reverb algorithms, made with the modern production environment in mind. Two different plate simulators and our own Superhall algorithm give you a broad palette of reverb, and the easy-to-understand interface makes adjusting the algorithms to suit your track incredibly simple. Want a traditional dark plate reverb? Eos can do that. How about a short, dense room sound for your drum buss? Not a problem. But where Eos really comes in to its own is when you drop Superhall on your piano or synthesizer tracks. The incredibly long modulated hall sounds of Eno-style ambience are where Eos thrives, something that is made of unobtanium with convolution 'verbs. Quite simply, an impulse response can not do what Eos does. » Three custom-designed algorithms: Plate 1 (mono in, stereo out), Plate 2 (true stereo), and Superhall (true stereo) built with modern production in mind. 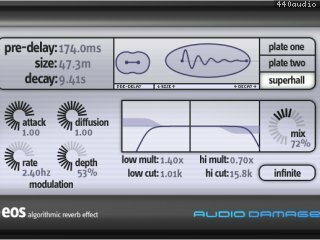 » All standard reverb controls, including modulation rate and depth, attack, diffusion, and full control over the EQ and multipliers of the reverb tail. » Infinite control for "freeze" effects. » Unique visual controls designed for quick and easy programming. » Low CPU usage compared to other algorithmic reverb plug-ins, and far lower than the average convolution 'verb. » Full MIDI learn for hardware control of most parameters (VST only). We have just put up a new installer for the OS X versions of Eos to address a bug with the automation in the AudioUnit version. If you only use the VST, or only use Windows, you don't need to install this update. If you use AudioUnits, it is a recommended update. 1. mono-mono and mono-stereo modes added to AudioUnit. 3. DRM removed from installers and plug-ins. 5. Minor graphics update for better legibility. This version of Eos is now "sandbox-safe," and will work fine in sandboxed hosts on OS X. The OS X version of Eos has been updated to 1.4.2 to correct a small bug introduced in version 1.4.1 where presets weren't showing up for AudioUnit versions. If you use the VST exclusively, or are on Windows, there is no need for this update. It is now true 64-bit for all versions. Windows 64-bit VST version added to Windows installer. New user interface on both Windows and Mac. Completely rebuilt AudioUnit. Many bugs with the AU have been fixed. PPC Mac support deprecated. Eos on OS X is now Intel only. You must delete the 1.0.2 versions of the VST and AU before you install these versions. Instructions for doing so are in the installer. If you do not delete the VST and AU before doing this update, the new versions WILL NOT WORK. If you are using the AU, your projects won't break, but this new version will reset whatever settings you have in the project to the default patch. Plan accordingly. The VST is not affected by this. If you own an Eos license, it is now in your account for download.